What is a Chord? Major, Minor, Diminished and More | Zing! Chords are the essential ingredients you need to become a great guitar player, songwriter or even a music philosopher. They give substance to songs and they’re often what makes a piece of music immediately recognisable. So, let’s answer your question. 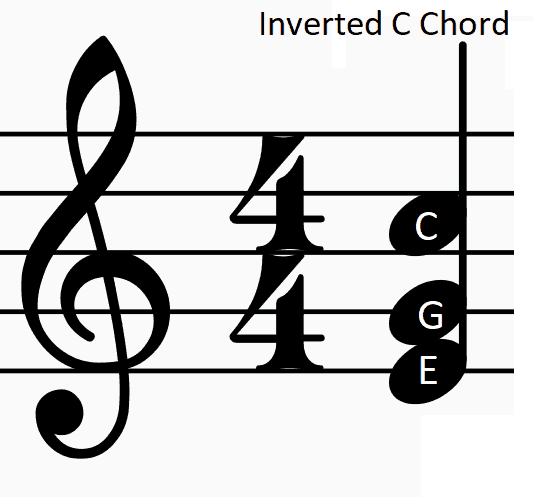 A chord is defined as 3 or more notes, played at the same time. The word originates from the Middle English word ‘cord’- which means string of a musical instrument – and has been used frequently in Western music for several centuries. Chords get their names, e.g. C, G, Am, from their first note, called the ‘root’. If you’ve spent any time learning about music theory, you’ll have probably come across the term ‘triad’. A triad is a chord of three notes. Triads use the first, third and fifth notes of a major scale. 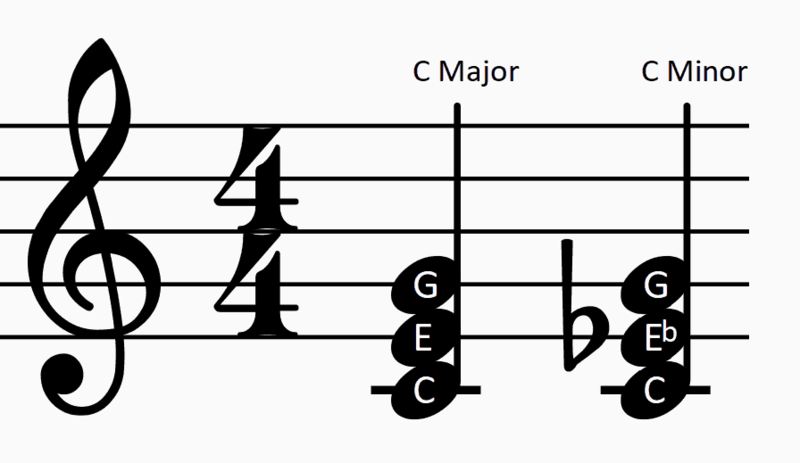 So, C major will use the notes C, E and G. Its minor sibling has a flattened third. This means that the notes in a C minor chord are C, E flat and G.
This flattened third is the basic difference between major and minor chords. Simple, right? As well as major and minor triads, there are many different chords out there. It’s very difficult to say exactly how many different chords exist, as the possibilities are enormous. All chords can be embellished with additional notes, which in turn will change the name of the chord. Also, these sets of notes can go by a variety of chord names! 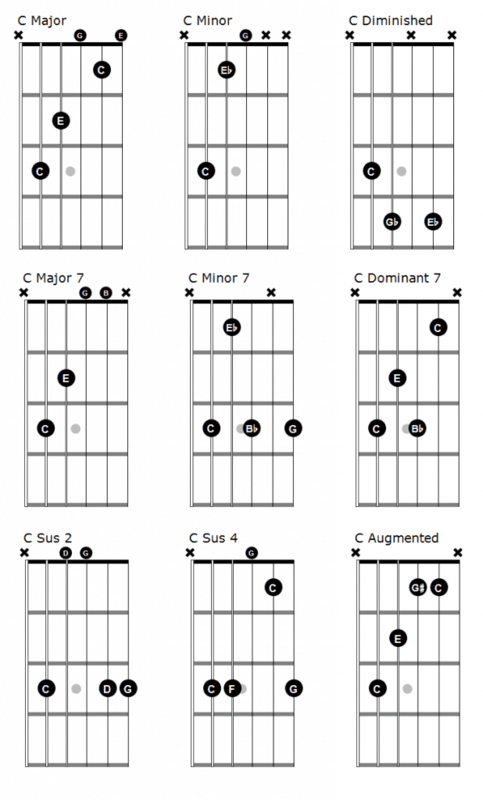 But, strange chords aside for now, there are nine main chord types that every musician should be aware of. Well, this is the big one. It is likely to be the first chord you ever learn. Major chords sound happy, and you’ll likely be using them for a while when you’re getting used to strumming. So get your smiley head on! These are sometimes called ‘concords’, as all of the notes seem to be in agreement with each other. Pretty cool, right? Pretty much all the songs you’ll want to learn are going to include these, so the world’s your oyster! Another biggie. You will be a master of the minor chord in no time. This is often considered the ‘sadder’ chord. The root note, minor third and fifth create a comforting harmony that isn’t quite as agreeing as the major chord. You could say it’s like the note in the middle had a slight misunderstanding with the other two. And it added a little tension to the atmosphere. Like major chords, these feature all over the place. Search for your favourite pop song and we bet it uses minor chords. If it doesn’t, search for your second favourite pop song! These chords can sound weird. Almost like you want to tune your guitar again. They can make for some pretty awesome sounds though. They are built by using a root note, a flattened third and a flattened fifth. 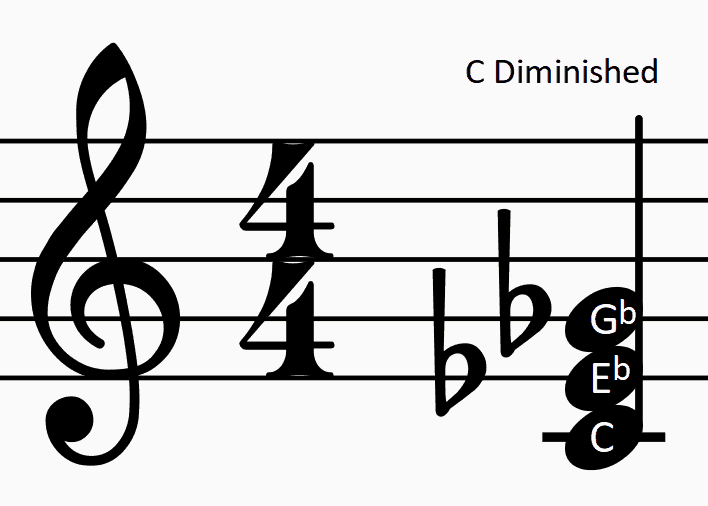 So, C diminished would be C, Eb, Gb. George Harrison’s ‘My Sweet Lord’ makes excellent use of diminished chords. 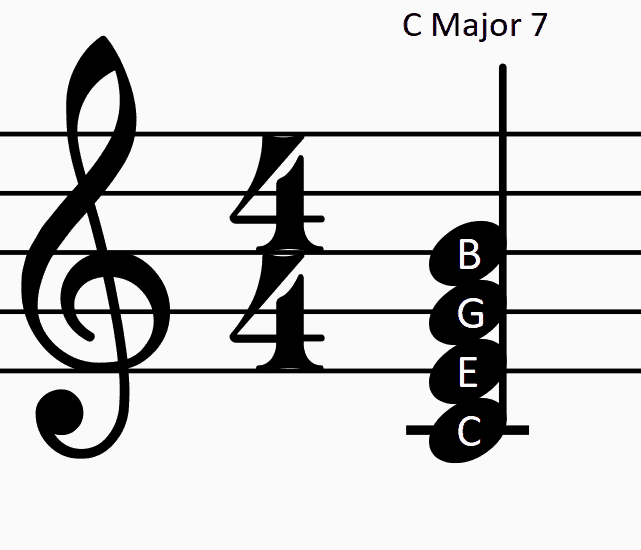 Often used in jazz music, a major seventh is a major chord with the addition of the seventh note of the scale. A popular song which uses major seventh chords is ‘Kiss Me’ by Sixpence None the Richer. 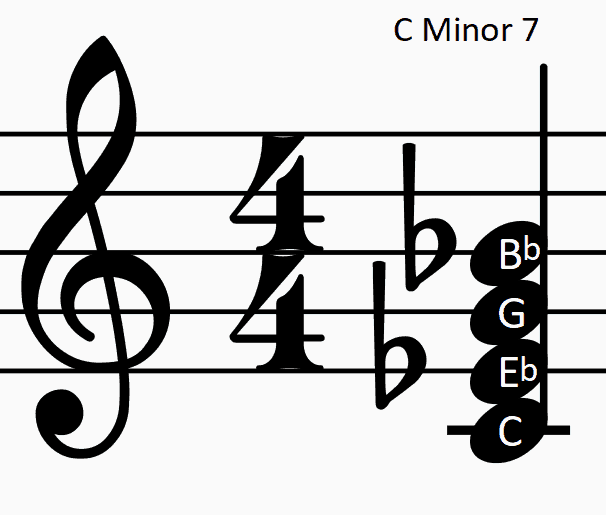 The minor seventh is a lot like a normal minor chord: music to emo teenagers’ ears. Indeed, it is a minor chord, with a flattened seventh added on top of the first, flattened third and fifth. Starsailor’s ‘Alcoholic’ uses several minor seventh chords. 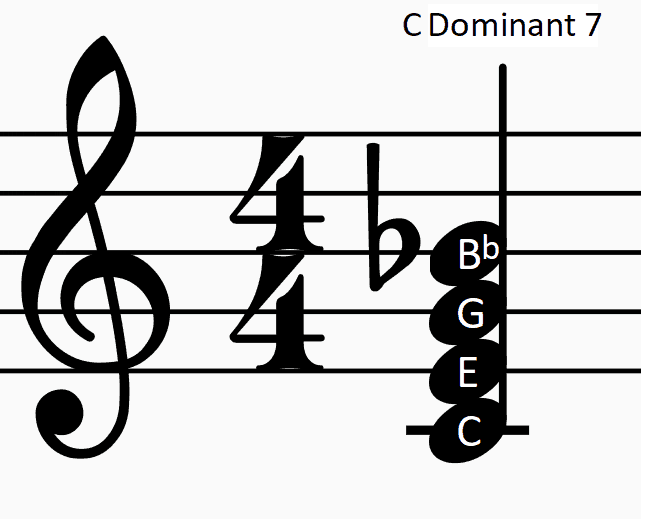 The dominant seventh is used in a host of musical styles. From pop to jazz, to Hip Hop and Blues. It’s just like a major chord, but with the addition of a flattened seventh. ‘Drive My Car’ by The Beatles uses a few dominant seventh chords. Here is where things get a bit more creative. You’ve just gotten used to the normal chord of root, third and fifth note. These bright and happy chords are built by using a root note, then they add a major second or a perfect fourth. 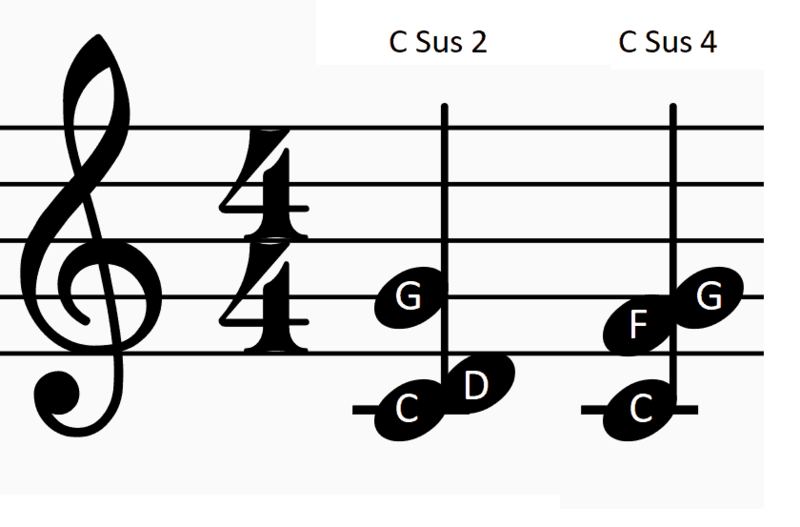 The third note of a suspended chord is a fifth. A great song that makes use of suspended chords is ‘Free Fallin’” by Tom Petty. Augmented chords can often sound nervous. They are built by using a normal major chord with the top note augmented. Augmented simply means it’s notched up one semitone. So, the formula here is first, third and sharpened fifth. 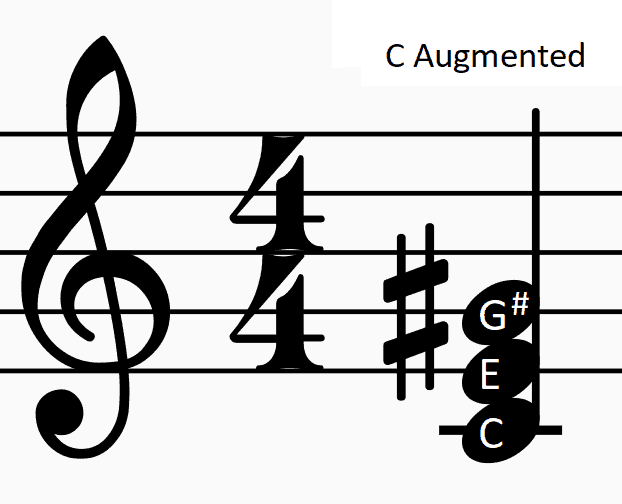 An augmented C chord would be C, E and G#. David Bowie’s ‘Life On Mars’ uses a fair few augmented chords. Extended chords are what they sound like: chords with extensions! If you are confident with major, minor and seventh chords, give them a go. Adding ‘new’ notes to chords you’re familiar with can open up some great creative avenues. You can find out what they’re called afterwards! Good luck! Sometimes, for ease of transition or for a different sound, we ‘invert’ the notes of a chord. All this involves is a little adjustment with which note is the root note. So, let’s once again imagine the C chord: C, E, G.
Now, let’s take the root note, C, and swap it to the next C. So the new root is E, making the chord E G and the higher C.
On the piano, this would generally still be called a C chord, however, on the guitar, this would be notated as a C/E. The /E refers to the fact that E is the first note you strike. Makes sense, doesn’t it? Whoa, right? That’s a tonne of information to process in a short amount of time. There are hundreds of chords out there, meaning lots and lots of shapes to remember. However, now that you know some of the theory behind how chords are made, the learning experience should make a little more sense. Becoming a master of chords will take a considerable amount of time. Practise, practise, swear, cry a little, then practise some more. Make sure you have fun though! 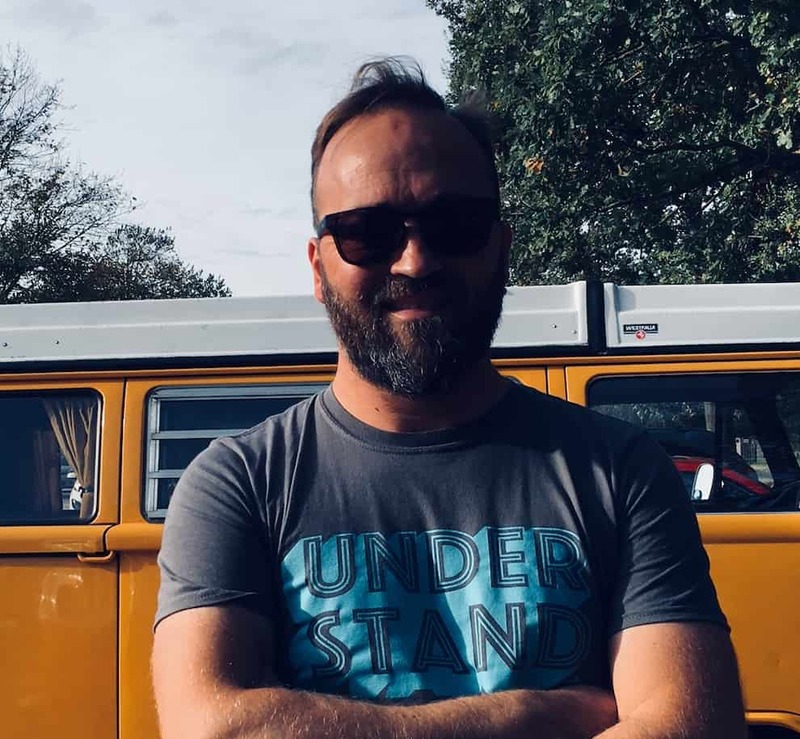 We hope that this article has given you something to think about, and you will be soon rocking away to all the hits.